Google Maps: Google has completely changed the search landscape with the introduction of Google Maps. When someone enters a search that Google determines is local in nature, they put up a map in the right hand column showing businesses near you. And then you will see listings in the left hand column related to the red dots on that map. Google keeps changing the way the listings are displayed. Right now there is a special section in the left hand column with all the Google Maps listings. 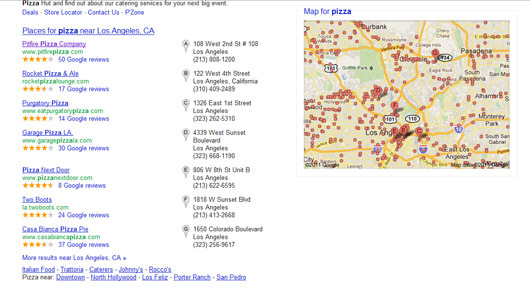 See below for a screen shot of a search for pizza. When I first started doing work on Google Maps I thought you could just throw up a listing on Google Maps and you were done. But I soon found out that with some particularly competitive industries, such as dentists for instance, that you had to continue to work it month to month by adding more and more listings on other sites (called “citations” in Google parlance, and Google sees these and it helps push your listing toward the top). Also it is important to work to get more reviews from customers. But if you get onto the first page of Google results via Google Maps, you will see good traffic from that. Google AdWords: Pay per click advertising through Google AdWords is very important for the local business, but only for relatively high ticket items, i.e. products or services that sell for say $200 or more. That is because of the large number of businesses that now advertise on Google AdWords, which pushes the bid prices up. So this works very well for say, a home improvement company that sells services starting at $5,000, but not so well for a company that sells something for $50. But if it is appropriate for your type of business, pay per click is a great way to generate leads or sales, quickly, and on an ongoing basis. And you can select the exact geographical area where your ads will appear, so you don’t waste your money on people outside your service area. Email Marketing: Marketing to people via email, specifically by creating a growing an “in-house” list of customers and prospects, is vital for the local business. I have observed that renting email lists, which was a huge deal back in the early 2000s, is now pretty much dead, because of the proliferation of spam. But if people are already aware of you, then email newsletters and other reminders about you and your services are vital today. This means you have to have things on your web site for what we call “capturing identities.” This means to have a “contact us” form, but also to offer things that will appeal to your prospects and especially appeal to people who would be your prospect but are not ready to buy right now. So it is a good idea to offer an email newsletter, as well as free information products such as free reports on topics related to your business. Basically these are things to build up your email list. Video: Having videos on YouTube and on various places on your site has become more important over the last few years. This is an excellent way to differentiate your company from the pack and show the public what you do. See my recent articles on video marketing (1, 2). Blogging: Having a blog and posting regular articles to it is an excellent way to drive traffic to a web site, although you can’t be guaranteed that everyone will be a local area resident. The key with blogging is to post things regularly, and to send a notice called a “ping” to blog search engines each time (this is done automatically in WordPress). SEO for General Keywords: If you are a dentist in Glendale, it is not very important for you to try to rank for the keyword “dentist.” Remember you will be competing with every dentist in the entire world. Similarly if you have a pizza restaurant in Pasadena, you should not try to do actions to rank for “pizza.” You’ll be competing with thousands of other restaurants and with corporate company sites like Pizza Hut and Dominoes. But I will add a big caution on this. I’ve seen companies similar to mine going around selling local businesses on services to get them to rank for local keywords like this. And the thing is that it will do you NO good whatsoever unless those keywords have some decent traffic coming to them. In other words, you can rank #1 for a keyword, but if no one is searching for it, so what? I have seen cases where someone was sold a package to get them ranking for local keywords and most or all of them had no value. So you have to do some research and see what kind of traffic the keywords have first before embarking on something like that. It depends on what industry you’re in and what location you’re in.